We have discussed the roles of and attitudes towards women many times here at ONBC. Comment on the women contained in this book. Below DITHOT has provided us with mini-bios on some of the women mentioned in Public Enemies and pictures where she could find them. Evelyn Frechette was also known as Billie. She had been born on Sept. 15, 1907 at Keshena, Wisconsin. Through out her life she tended to drift on the other side of the law. When Billie met John Dillinger in the fall of 1933, she had been married to Welton Sparks, ( also known as Walter.) He however was serving a life term at Alcatraz. There is little doubt that she had loved John, and remained loyal to him, even after her arrest on April 9, 1934. After her arrest by the FBI, Billie claimed that she had been slapped by an agent and was refused sleep or food for over 24 hours. Evelyn was convicted of harboring John on May 23, 1934 and served a two year sentenced at Milan, Michigan. Upon her release on Janurary 30, 1936, she toured with a traveling carnival billed as John Dillinger's sweetheart for a few years. Billie remarried twice, the first ended in her husband's death and the other marriage was in danger at the time of her death from cancer on Janurary 13, 1969 in Shawano, Wisconsin. Helen Wawrzyniak Gillis, wife of Lester "Baby Face Nelson". She married Nelson at the age of 16 and had a baby within the first year. Within a short time, she had another baby. By the time she was 20 years old, she was declared Public Enemy #1 with a "shoot to kill" order in effect. Arrested at the Little Bohemia raid and later released on parole, she met up with her husband about a month later. Her probation was revoked shortly after the death of Nelson in a shootout with FBI Agents Sam Cowley and Ed Hollis. Both agents were killed in the shootout, as was Lester Gillis. She died in 1987 and is buried in Chicago next to her husband. It is not clear what Polly’s role was in 1920s Gary, Indiana. She was married to a policeman named Roy Keele, who divorced her, charging her with neglect. She had no children from her marriage to Roy. She called herself “Dillinger’s Countess.” She may have worked in Anna’s houses as a maid, as a partner, or perhaps, as a prostitute. Polly managed to hide from the press for a few days after Dillinger’s death and left for Chicago shortly after. Polly Hamilton remained in America. Although born in Canada, deportation was not mentioned in her case. One of the lucky women of the Dillinger era, she avoided serving time in prison. When it felt safe to return, she came back and made the City her home. Polly was able to drop out of public sight. She reclaimed her given name of “Edythe,” and remarried. She lived quietly as a housewife in Chicago’s Old Town District until her death. She died on February 19, 1969. Born in Romania in 1892, she immigrated to America in 1909 with her first husband, Michael Chiolak. A year later, she gave birth to a son, Steve. Sage worked as a prostitute at "Big Bill" Subotich's place in East Chicago, Indiana. When she started dating Martin Zarkovich, an East Chicago police officer, Chiolak divorced her. In 1929 she married Alexander Sage, but eventually got a separation. When "Big Bill" died, Sage took over the management of the East Chicago brothel where she had been working. She later opened brothels in Gary, Indiana, and Chicago. Sage was facing deportation charges as an "alien of low moral character." She thought that if she turned Dillinger in to the authorities, the government would allow her to stay in the United States. Her old friend from the East Chicago police department, Mark Zarkovich, made the connection to the federal agents on the case. Sage called Purvis to tell him that Dillinger had invited her and Hamilton to the movies that evening. She said she would be wearing an orange skirt and white blouse to make her easily identifiable. Sage received a $5,000 reward for giving information leading to Dillinger's capture. However, she went public because she believed the government was not keeping its bargain. The federal courts maintained that only the Department of Labor had any authority in deportation cases, and was not obligated to honor promises made by Justice Department "gangbusters." On April 25, 1936, Sage was forced to return to Romania, where she died of liver failure on April 25, 1947. Mary fell in love with Harry Pierpont during the 1920s, when Harry went on trial with her brother, Earl "The Kid" Northern, for the robbery of a South New Harmony, Indiana bank. With the October, 1933 escape of 11 convicts from the Michigan City Prison, including Harry Pierpont, Mary joined the gang of escapees. She would remain loyal to him as he prepared to die in the electric chair at the Ohio State Prison. By then, she was giving interviews and participating in a carnival show devoted to stories of life with Dillinger. She tried to shelter Pierpont, spending the money she earned to fund his useless appeal. She lived until May 21, 1981, when she died of emphysema and heart disease in Indianapolis. Mary died penniless and is buried without a marker. 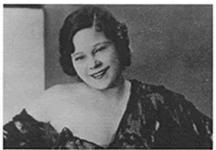 Sally Bachman: Sally Bachman was a member of the gang who harbored Baby Face Nelson. John Paul Chase chose her for his woman companion in the last, desperate days before Nelson was killed and he, himself, began a life term for murder of a G-Man. She lived and worked in San Francisco where she made her living selling tickets to commuters crossing the San Francisco Bay. One fateful night, a car pulled up to her ticket booth on Fisherman's Wharf. Witnesses described some "rough looking men" who invited her to take a ride with them. Sally never returned to work. She traveled with Chase as far east as New York City, where they kept a hideout in the St. Andrew's Hotel. She traveled through the hills of Reno, Nevada when the gang was hiding as the hunt intensified and "G-Heat" was at its zenith. Chase was convicted of the shooting death of Special Agents Samuel Cowley, who died along with Ed Harris at the "Battle of Barrington," which also claimed the life of Baby Face Nelson in November, 1934. Sally Bachman took the witness stand on March 29, 1935 where he testified against Nelson's friends. Ensuring the convictions of these mobsters, she returned to private life, with a life-long fear of gangland reprisal her only nightmare. The girlfriend of Homer Van Meter, “Mickey” was an elementary school graduate who had not attended high school. She and Van Meter started keeping company after his parole in May, 1933. She left home and lived with him, accompanying him to St. Paul and Chicago. She posed as his wife, using names like “Mrs. Hank Adams,” “Mrs. Wayne Heuttner” and “Mrs. Henry Ober.” It was an era when a woman traveling with a man was forced by society’s mores to pose as a married woman. 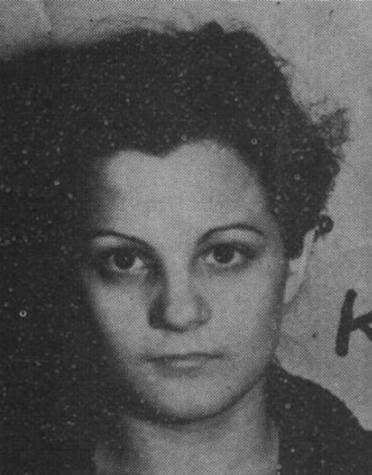 Marie was one of the three women captured on April 22, 1934 at the Little Bohemia Lodge, and was interrogated for days until she agreed to give information. She then returned to Van Meter, but the trust between the two had disappeared by then. She blamed him for abandoning her, and he suspected she had talked to the FBI. After Van Meter was killed, Marie turned herself in on a Chicago street corner. She expressed no remorse over the death of FBI Inspector Samuel Cowley, killed at the Battle of Barrington by Baby Face Nelson and John Paul Chase. Her flippant attitude toward Sam Cowley angered the FBI, and she was not given a lighter sentence although she had informed. She was convicted of Harboring Van Meter, and sentenced to serve one year and one day. After she was released from prison, she was re-arrested. She was charged with the same crime but in a different Federal jurisdiction, along with Ella Finerty, her former landlady, and returned to prison in 1936. She was one of two women who was tried twice for the same crime but in a different location. Pat Cherrington's sister, Opal Long, lived with Russell Clark and Charley "Fat Charley" Makley. She scrubbed for them, and cooked Charley his "3-5 minute eggs." Opal Long was devoted to her care giving role. She prided herself on her loyalty to the gang members, or "the kids," as she called them. She was a big woman, red-headed and near-sighted. She listed her birthdate as March 20, 1906. She said she was born in Texas. She worked as a waitress in Chicago from 1926 until her arrest by Chicago police on June 2, 1934. 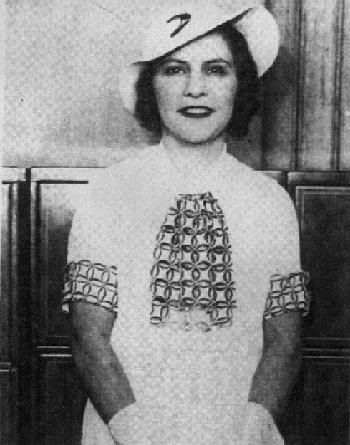 Opal Long traveled with Russell Clark until the sensational arrest in Tucson, Arizona on January 25, 1934. Opal Long was released in the company of Evelyn Frechette, and afterwards, worked tirelessly to raise money for Clark's appeal. After Clark's arrest, she became an unwanted visitor to the band of outlaws formed by Dillinger after his Crown Point, Indiana, escape from the St. Paul apartment in March, 1934. Blamed specifically for the raid on Dillinger's St. Paul apartment, and indirectly for the subsequent death of Eddie Green, Opal was then treated as an outcast. Dillinger saw her as a person who was only looking for money for Clark's appeal. While he wanted to help her, he had to help himself as the net was closing in. Louis Piquett, Dillinger's attorney, provided no legal help after her arrest. She was destitute, and pleaded guilty to having harbored John Dillinger and John Hamilton, on the date of March 30, 1934, in the St. Paul apartment on Lexington Avenue. She was sentenced to 6 months in the Minneapolis Workhouse. She refused to give any information about the gang that would have made her life easier while in prison. In other words, she never became a "stool pigeon." She was parolled in November of 1934, and remained in Chicago. Girlfriend of Alvin Karpis. Following the killing of Ma and Fred Barker, Alvin Karpis and Harry Campbell fled north to Atlantic City. Cornered by police at the Dan-Mor Hotel, on January 20, 1935, they shot their way out and escaped. Their mistresses, Dolores Delaney and Wynona Burdette were captured and later sentenced to 5-years for harboring federal fugitives. Dolores gave birth to a son in custody, named Raymond Alvin Karpis, who was given to Karpis' parents in Chicago to raise. Dolores Delaney went to St.Paul and Chicago after prison. She tried to reconnect with her son, but he didn't know her. He thought of his grandparents as his parents. Dolores tried several times over the years to connect, but to no avail. Ultimately, her son recognized her as his mother but kept his distance. Karpis and Dolores were both disappointed when their child did time for burglaries at about age nineteen--at Joliet. 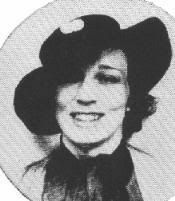 Jean Delaney Crompton: Girlfriend of Tommy Carroll, sister of Dolores Delaney. She was arrested at Little Bohemia and imprisoned at The Alderson Federal Correctional Facility on June 11, 1934 and paroled March 31, 1935. Born on September 26, 1903 in Arkansas, she struggled to raise a daughter, born when she was a teenager in Tulsa. To support herself and her little girl, she worked in Chicago nightclubs as a chorus line dancer. During the 1920s, she commanded a high salary for dancing in the speakeasies of Prohibition-Era Chicago. She dated Dillinger-gangster Harry Copeland and Dillinger's close friend, John "Red" Hamilton. Hamilton's death marked the end of her life as a gangster's "moll." She was soon arrested for harboring John Dillinger and John Hamilton in the Little Bohemia Lodge. Once in prison, along with her sister, Opal "Bernice Clark" Long, Patricia found herself abandoned by the gang's lawyer, Louis Piquett. Because she was impoverished, he shrugged off her problem by telling her to plead "guilty." Without legal counsel, she was committed to the Alderson Industrial Reformatory. After she was released, in 1936, she was again tried under the Federal harboring law. This time, the charge was for harboring John Hamilton and John Dillinger during the historical visit to the home of Hamilton's sister, on the night of April 17, 1934. She died in 1949, at the age of 45 years of age. She is buried in Wunders Cemetery in Chicago. Patricia was the quintessential Dillinger "moll." Perky, vivacious, an ex-chorus line dancer, she coined an apt description of John Dillinger. He was a "good piece of company." Paula Harmon: Girlfriend of Fred Barker, arrested in Cleveland because of an incident in a hotel bar. Paula Harmon had a nervous breakdown after being interrogated from September 5, 1934 to September 25, 1934, in Cleveland, by FBI agents. This was when she, Wynona Burdette and Gladys Sawyer (and Francine--Sawyer's daughter or guest) were arrested by Cleveland police. Harmon was hospitalized for about 24 hours after she surfaced. Then, she took a train to Port Arthur, Texas. She was interviewed the next month, at the home of her parents. The agent determined she would not make a good witness for any upcoming trials. Her mental condition was too shaky. Over the next months, she got worse. She attempted suicide a number of times and on January 20, 1935 (just four days after Fred and Kate Barker met their fate), she was ordered by the court to the State Hospital for Insane at Rusk, Texas. She was in that institution for about 18-20 months. When interviewed again in 1936, the FBI agent found she was working out of her parents home, doing sewing. Her mental condition was still not too good. But, she was making a fair amount of money from the sewing. Kathryn was born Cleo Brooks in Saltillo, Mississippi in 1904. She later changed her name to Kathryn believing it to be more glamourous. By the time she was 15 she was married to a laborer, Lonnie Frye, with whom she had a daughter she named Pauline. Over the next few years Kathryn was arrested several times. Included in the charges were shoplifting in Fort Worth, and robbery in Oklahoma City. She also spent time in jail for prostitution and for receiving stolen goods. Apparently criminal behavior ran in her family. In addition to her mother’s bootlegging operation, she had two uncles in Leavenworth, one for stealing automobiles, the other for counterfeiting. Her aunt was a prostitute and her cousin was a bootlegger. By the late 1920s, Kathryn was working as a manicurist in Fort Worth. Legend has it that it was Kathryn that created the Machine Gun Kelly image. She was said to have purchased the first Tommy gun that Kelly ever owned and that she made him practice with it. She then handed out spent cartridges to friends and relatives as souvenirs. While George was working for bootlegger “Little Steve” Anderson in Oklahoma City, Kathryn was Anderson’s mistress. Soon George and Kathryn fell in love. The two ran off together, taking Anderson’s new Cadillac and his prized English bulldog with them. They went to Minneapolis after Kelly’s release from Leavenworth and, in September 1930, got married. After being arrested, Kelly and his wife were arraigned the same day at the Shelby County jail where they both pled not guilty to kidnapping Charles Urschel. Kathryn told the Memphis police chief, “I’m glad we are both arrested because I am not guilty and I can prove it. I’ll be rid of him and that bunch. I don’t want to say anything about that guy Kelly, but he got me into this terrible mess and I don’t want to have anything more to do with him.” On October 7, prior to Federal Judge Edward S. Vaught handing down sentences, Kelly and his wife entered pleas of not guilty. The jury took less than an hour to reach a verdict. On the morning of October 12, George and Kathryn Kelly were convicted for their roles in the Urschel kidnapping and sentenced to life in prison. Kathryn Kelly told the authorities that if she weren't housed with her mother, she would use her influential friends to get herself released. Kathryn was first placed in a federal facility in Cincinnati. During the mid-1950s, she served time in a prison in Alderson, West Virginia. Later that decade, she was in Milan, Michigan. In Milan, Kathryn wrote poetry and articles for the prison newspaper. She eventually became the assistant editor. Kathryn and her mother, Ora, were released from prison in June 1958, on a $10,000 bond. Kathryn’s mother was placed in the Oklahoma County Home and Hospital in Oklahoma City. Wishing to be near her, Kathryn found a job there as a bookkeeper. She lived on the property, eventually becoming a recluse. Vi Mathias: Vivian Gibson was an attractive, willowy young farm girl from Leola, South Dakota. When she was sixteen Vivian, or Vi as her friends called her, eloped with Stanley Mathias, an employee on her father's farm. Stanley was convicted of murder and Vi, and their child, went to Minnesota where she met Verne Miller. Following Miller’s participation in the Kansas City Massacre she was arrested. Mathias was taken into custody and later pleaded guilty to charges of harboring and concealing Miller. 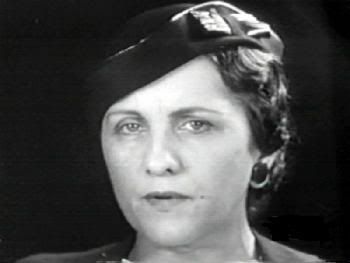 In a statement coerced through intensive interrogation for 12 days and nights, Vivian Mathias told the story that the Federal Bureau was looking for that occurred on 16 June 1933 through 17 June 1933 concerning Verne and the night of the Massacre. Much of the information here was found on the site below. You can see some of their copyrighted pictures and much more information. Liz, I think they had a hard time of it. They mostly had come from difficult backgrounds and were grabbing some good times when they could. No angels, perhaps, but victims of circumstance? Like when Dillinger was betrayed, they had to make hard choices, ones to do with self preservation. I'll have a closer read later, though. Good question, the blonde. I wonder if the answer is in the book written about them entitled, "Don't Call Us Molls". Liz, I'm getting references to a mary being a prostitute and moll being a shortened form of mary, a very old term indeed, but gangsters moll itself dating from only 1923. But I have to say, this seems unsatisfactory as an explanation. At least from the info in the mini-bios, it's hard to find anything in the molls' lives that most women would desire in a relationship...maybe some 'love,' but no home life with children, security, productive activity, self esteem, honesty.... Many married and bore children very young, had previous criminal relationships and little education. Most were quite attractive and loyal but ended up dying young, imprisoned, separated from their children, multi-married...just didn't seem like they had happy endings from their choices to get involved with gang members. Their gangster loves did not take the best care of them! And I think women were more dependent on men in those days. Maybe they found their lives exciting, but they seemed pretty tawdry to me. Ah, the Young and the Restless, 1930's-style! It's impossible for me to judge these women; I can't imagine what alternatives were available to them. My sense is that they were, in general, products of their class and gender, and of society's bias and stereotyping back then. Being from small towns, rural communities and the like, with little education and questionable talents, I'd say their prospects for a happy future were pretty bleak from the get-go. When the US economy started to tank, I assume they felt even more marginalized. It's possible they figured they had nothing to lose and everything to gain by hooking up with a guy who would get them out of wherever they were, or with a guy who offered them something they couldn't get 'back home'. Reading their stats and bios doesn't tell the whole story (I hope); there must have been more to it - more of a payoff - than what's offered in a few anecdotal paragraphs. I liked them, too, Parlez, except for Ana Sage, because of her betrayal of Dillinger, and Gladys Sawyer, because she appeared to be a neglectful mother to her adopted daughter. I felt that these women were independent, strong and survivors. I have to admire Billie for not talking to the FBI. I think that takes strength. None of the women in this book were what I expected. They didn’t fit into my stereotypical idea of a moll or of a 1930’s woman. And I was quite proud of Crown Point for appointing a woman sheriff…..Lillian Holley. That is quite progressive for that day and age. In fact, I had to read the passage that first speaks of Holley to make sure I was reading it correctly. Endora, I did a quick look on the internet for a definition of moll and didn't get any further than you did. But that's more than I knew yesterday. I didn't know that "Molly" was a derivative of "Mary". I liked them, in the main, though not Anna or Polly. I feel sorry for them, especially when I think of the moment in the book where Helen Gillis is dropped off in her home town and goes walking by her old home. I can't find the quote now, but Burrough says something about her intelligence at that point. How sad, though, to be wandering the street like a ghost, excluded from her old life. And she married so young, at 16. I also feel sorry for them for their hard lives and what happened to them afterwards. Being tried twice for the same crime hardly seems fair. I find it hard to imagine Helen as PE #1 - I don't remember her active involvement in crimes. Perhaps it's because it's late at night for me here or something. I think the clue to their choices lies in their backgrounds. Some of them came from families which already had a criminal element. And what they were doing at the time was condoned by a number of people, to the point where Hoover felt he had to give a clear message about that to the public. Some of them demonstrated remarkable loyalty to their men too. I find it strange them having children given their life styles - yet of course it would be so natural and inevitable too. That story of Delores' son not bonding with her, and her reaction to his crimes is very poignant. Although she made a new life for herself afterwards, I also think she paid her dues for her time with Karpis - like a lot of them. I was really surprised how these women were taken along with the gangsters from place to place while pretty much living openly (movies, dancing, etc) It seemed to me they had a pretty good life while it lasted. The lives of ordinary women in the 30s Depression era were lives of drudgery and difficulty. The molls had some excitement, some freedom, and some fun. It is true they also had a lot of pain and they paid a price in the end, but I don't know if they would have been happier spending their days at a wringer wash machine or standing over a hot stove cooking porridge for a brood of children -- how many of those women ever got to go out and do anything? Their other alternatives were not very attractive, either. Maybe I read them all wrong. But Billie's refusal to betray Johnnie, and even Anna Sage's actions to try to save herself from deportation, tells me these women were a lot stronger than we might think, and less victims than survivors. Parlez, I too have a hard time judging them. Again, it is hard to put myself in their time period and not look at them from a modern point of view. In a way I am reminded of the women we met in On the Road. A vagabond existence, living outside the law in many instances, devoted to their partners but having little existence apart from them. Some of them seemed very strong and knew what they were doing and wanted, like Kathryn Kelly. Others seemed to be running off with their guy and damn the torpedos, like Bonnie or Billie. Others seemed to be just swept up in their moment in time. I wonder if we will see any of them (besides Billie) in the movie? suec wrote: I also feel sorry for them for their hard lives and what happened to them afterwards. Being tried twice for the same crime hardly seems fair. I find it hard to imagine Helen as PE #1 - I don't remember her active involvement in crimes. Perhaps it's because it's late at night for me here or something. Well, that's not my excuse. I felt the punishments were harsh, also, and inconsistent among the various women. It was sad to read that some died penniless. And although Paula Harmon was making decent money, she had mental issues. nebraska wrote: It seemed to me they had a pretty good life while it lasted. The lives of ordinary women in the 30s Depression era were lives of drudgery and difficulty. The molls had some excitement, some freedom, and some fun. It is true they also had a lot of pain and they paid a price in the end, but I don't know if they would have been happier spending their days at a wringer wash machine or standing over a hot stove cooking porridge for a brood of children -- how many of those women ever got to go out and do anything? I had this thought, also. DeppInTheHeartOfTexas wrote: Parlez, I too have a hard time judging them. Again, it is hard to put myself in their time period and not look at them from a modern point of view. In a way I am reminded of the women we met in On the Road. A vagabond existence, living outside the law in many instances, devoted to their partners but having little existence apart from them. Some of them seemed very strong and knew what they were doing and wanted, like Kathryn Kelly. Others seemed to be running off with their guy and damn the torpedos, like Bonnie or Billie. Others seemed to be just swept up in their moment in time. I wonder if we will see any of them (besides Billie) in the movie? To me, the difference between the gangster's molls and the women in OTR is the molls got taken along by their men, whilst the women Kerouac wrote about mostly got left behind. Of the two, I'd rather be the moll, taken along for the ride! From what we read in the two books it does seem like the women of PE had a bit more fun! OK , Here I go again with my defending the underdog. I feel more sympathy for the females because they were born into a tough era. Women were held to stricter morals, and making a living back then would be limited to menial tasks because women were lucky if they could reach high school . The line about Van Meter's girlfriend having to pose as married to travel tells a lot about the times. The poverty that hit the country made them even more dependent on a male to eat. Several seemed to end up in dance halls or less seemly jobs because they had children and no husband around to support them. Yes it does seem that they had poor choice in men but it seems that a larger percentage of men back then ended up in jail because there were no jobs. I think some of them like Katheryn Kelly were from a criminal family and took what ever they could from life. Some of the others though seem to just be trying to make ends meet and dance halls probably made more money then sewing. A couple of the girls were just plain unlucky and married young and then found out what kind of husband they had and stayed so the kids could eat. Mrs Baby Faced Nelson comes to mind. I think some of them choose to be prostitutes like Anna Sage, and even Polly Hamilton. Polly quit a waitress job to be with Dillinger but I find it hard to believe that she didn't know what went on in her apartment building. She was looking for a sugar daddy to get her out of that situation. Poor Mary Kinder just fell in love with a handsome louse. Pat Cherington and her sister Opal seemed to just hang around as girlfriend or housekeeper just to get by. What bothers me is the attitude of the FBI that they were less than important. They could be abused by criminals and lawmen, tried twice for the same crimes abused for days in interrogation. They were even thought of as lower then their criminal men friends. One more thing bothered me about some of their sentences. Most of them were not gun molls just wives and girlfriends. The wives who were sentenced for harboring their husbands. What happened to for better or worse and what about their kids? It seems that the law trumps all other promises you make in life. Some of them actually loved their men and were jailed for that.